This property is located at 19-21 London Road in Heathrow. Check room availability using the search box on your right. The building was built in the mid-1800s for the families of the management of The Great Western Railway. 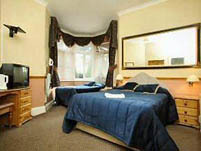 The hotel enjoys a practical location off Junction 6 of the M4 near Upton Court Park on the eastern fringes of Slough. Windsor Castle, Eton College and legoland are all close by. Slough town centre is also just five minutes walk.